India has witnessed a long journey since 2000, when its GDP at 46,214.68 crores INR started to rise phenomenally to almost five times, to around 2.26 Lakh Crore INR in 2016 . 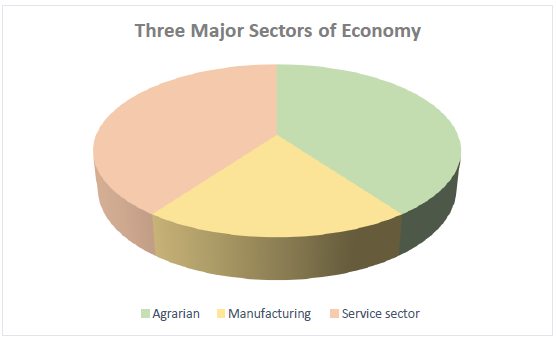 Since contribution towards it can be traced back to three major sectors of economy, mainly, agrarian, manufacturing and service sector, it is reasonable to observe that growth must also have been observed in these individual sectors as well. Although it is true, but not all sectors displayed equal proportions of growth. Service sector paced forward, while manufacturing and agrarian sectors lagged behind. Since there is a little scope to add value in the agriculture sector, the onus of boosting the economy further falls upon the manufacturing sector. With this concept in mind, under the banner of “MAKE IN INDIA” initiative , it was envisaged by the present Government to bring an increase in the share of manufacturing in the country’s Gross Domestic Product from 16% to 25% by 2022 by making sure that the sector ensures and endures a growth rate of 12-14% per annum over the medium term . In order to support this vision, funds were mustered from every source possible and it is evident from the fact that cumulative Foreign Direct Investment (FDI) in India’s manufacturing sector reached US$ 73.70 billion during April 2017-December 2017 . In wake of such heavy investments made, it is obvious to assume that the sector will observe some turbulence on the positive side. Further, a lot of policy related measures have been taken in this regard, including improvisation of Intellectual Property (IP) protection measures and their effective administration, including computerized work flow along with digital manuals that were made available to the applicants have streamlined the process. However, it can be observed that executive focus is highly customised with regard to different kinds of intellectual property rights. This opens up scope to find out the potential among those regarded as the underdogs. Moving ahead, from a recent report from World Economic Forum on “Global Competitive Index – 2018” , India was placed at 40th position while Switzerland was placed at the top. 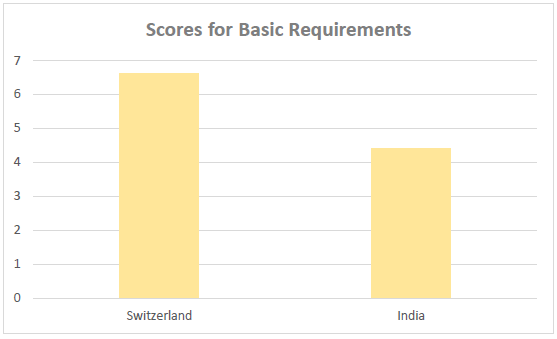 On a comparative analysis, the score for Basic requirements section which comprises of Institutions, of which Intellectual Property protection is a part, India scores 4.4 points at 52nd position, while Switzerland is on the top with 6.6 points. The margin in both rankings as well as points is quite high, and steps taken to develop this domain can help to bring early signs of positive change. The domain of Intellectual Property is reasonably wide and is divided into two parts: copyright and industrial property. Copyrights generally do not require registration which makes it difficult to track and monitor. According to Article 1(2) of Paris Convention for Protection of Intellectual Property which reads as “The protection of industrial property has as its object patents, utility models, industrial designs, trademarks, service marks, trade names, indications of source or appellations of origin, and the repression of unfair competition” . Industrial property refers to assets created primarily for the advancement of technology, industry and trade such as patents (inventions), industrial designs, trademarks, service marks, trade secrets and geographic indications of origin . Industrial design (also interchangeably referred to as “Design” or “Design Patent”) recognizes creation new and original features of new shape, configuration, surface pattern, ornamentations and composition of lines or colours applied to articles which in the finished state appeal to and is judged solely by the eye . A Design, under Section 2(d) of The Designs Act, 2000  refers to the features of shape, configuration, pattern, ornamentation or composition of lines or colours applied to any article, whether in two or three dimensional (or both) forms. This may be applied by any industrial process or means (manual, mechanical or chemical) separately or by a combined process, which in the finished article appeals to and judged solely by the eye. Design does not include any mode or principle of construction or anything which is a mere mechanical device. It also does not include any trade mark as defined under Section 2(l) of The Trade Marks Act, 1999  or any artistic work described under Section 2(c) of The Copyright Act, 1957 . Also, property marks as defined under Section 479 of Indian Penal Code, 1860  will be excluded from the scope of design. If the design is not new or original, or cannot be distinguished from the existing design or combination of such designs or contains scandalous or obscene matter, the such design shall not be registered. Further, a design is barred from registration if it has been disclosed to public prior to the filing date. The registration of a design, under Section 11(a) confers upon the registered proprietor the exclusive right to apply a design to the article in the class in which the design has been registered. This implies conversely that no right exists of any proprietor of a design that has not been registered, and hence cannot be enforced in the Court of Law against any such infringer. A registered proprietor of the design is entitled for protection of his intellectual property. He can take step against infringement, if his right recognised by law is infringed by any person. He can license or sell his registered design as legal property for a consideration or royalty. Registration initially confers this right for ten years from the date of registration, with a further extension of five years. The right expires if extension for registration is not applied for within stipulated time. Hence, non – registration possesses a potential loss of any enforceable right against the infringer, as a risk management tool. Moreover, the fee charged for registration seems to be reasonable keeping in view the rights protected by it for a period of about fifteen years. For instance, it takes around INR 1000 for registration of a design . And if a design is meant for industrial production, it must provide returns greater than the registration fee, which is again quite possible. However, in the absence of any registration for a given design, the design is vulnerable to piracy and proprietor stands to lose market as well as profit share at his/her own expense. An estimate of losses can be observed by drawing inference from the fact the total international trade in counterfeit and pirated goods is estimated to value around half trillion USD  with around half of it effecting the industries that could have been protected under designs act. The business of piracy and counterfeit goods also result in employment losses of 2.5 million, with a total global economic and social cost, when estimated liberally seem to touch around a trillion USD. Also, it is assumed for UK market that it may lead to displacement of more than half of the market share of genuine products. In India, it is responsible for eating away a market share of 30% with estimated losses of 9000 crores INR to Auto components market alone with total loss accruing among seven prominent sectors was estimated to be around 73000 crores INR . It is worth mentioning that out of 24898 applications filed, design registrations at about 2935 account for only one – eighth of the total share in comparison with 9584 patents granted in the year 2016 – 2017 . This itself talks about the scope in increase of design registration as it is completely product based, and product are re – modified and re – designed in order to maintain their demand in the market. For the purpose of registration of a design, the procedure is carried out in accordance with Rule 10 of The Design Rules, 2001 which deals with the classification of goods with respect to which registration of design has to take place. There are 31 different classes with Class 99 which is a miscellaneous class and includes all products not included in previous classes. Any contravention of The Designs Act, 2000 by the infringer will impose a liability to pay to a registered proprietor a sum of up to twenty – five thousand rupees under contract debt. Further, if a suit is brought, damages valuing up to fifty – thousand rupees along with injunction can be prayed. India, on the other hand is a huge promising market, being placed at number 3 due to its sheer size, and hence can act as an attractive site for design registration. When collaborated with the vision of transforming the nation into a highly industrialised manufacturing hub. This is further consolidated by when it is observed that top corporate applications are lined up for the purposes of registration. Also, the design registration is available to foreign players who wish to enter and exploit the open Indian market. Further, Indian manufacturers must also make sure that their designs are not only protected by The Designs Act, 1999, but also by the design law of those economies where they wish to sell their product. The registration under The Designs Act is an effective and cost – friendly risk management tool for both domestic as well as foreign players and hence should not be avoided at any cost. Author: – Madhur Tulsiani, Intern at Khurana & Khurana, Advocates and IP Attorneys. Can be reached at paras@khuranaandkhurana.com.